Mukesh Ambani-owned Reliance Jio Infocomm is offering 75GB 4G data, 4500 minutes VoLTE home and roaming talk-time and 9000 messages with 90 days validity under combo plans that come bundled with LYF smartphones and Mi-Fi device to its group employees. Jio is already leveraging its content play, and is offering unlimited access to its content and storage services along with the data and voice benefits. Jio employees and their families are getting unlimited access to Jio Play, Jio VoD, Jio Beats, Jio Mags, Jio News, Jio XpressNews, and 101 GB storage facility on Jio Drive service. 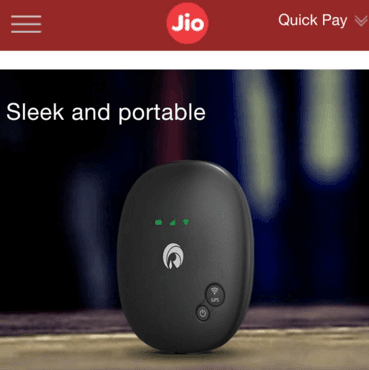 The service plans and device prices are listed at Reliance Jio’s employee portal, which was reviewed by TelecomTalk exclusively. These service plans are limited to Jio employees and their families. However it is most likely that similar plans with minor modifications will be rolled out for retail customers around March-April. 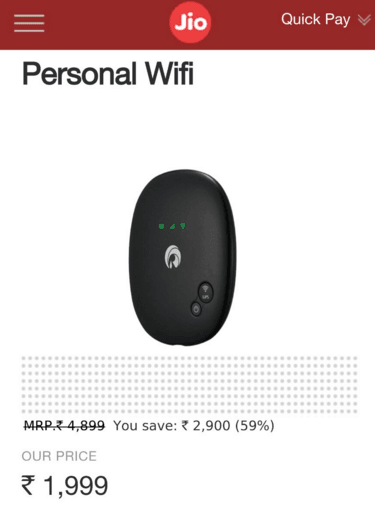 Jio is offering 59% discount on the MI-FI device, called Personal Wi-Fi, which is now available at Rs 1,999 for its employees. 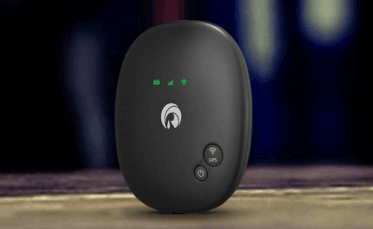 The device is powered by a Qualcomm 9320 chipset, and comes with 2100 mAh lithium-ion battery, and can connect upto 10 users at once. Jio is also offering heavy discounts on its LYF branded and third-party smartphones to its group employees and their families. The telco is offering LG Spirit LTE smartphone, which has a MRP of Rs 15,500, at just Rs 5,000. 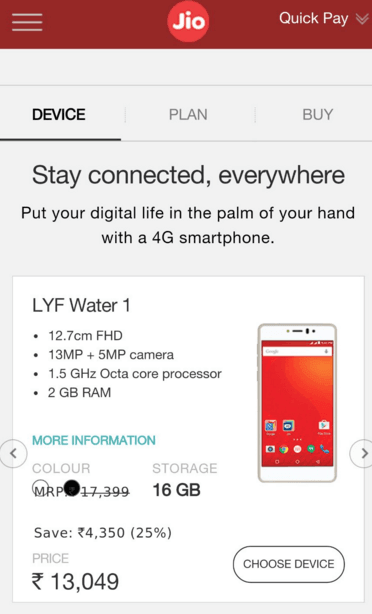 The LYF Water 1 smartphone is available at a discounted price of Rs 13,049 (Original price is Rs 17,399). The LYF Water 2 smartphone is available at a discounted price of Rs 11,624 (Rs 15,499), while LYF Earth 1 is priced at Rs 19,350 (Original price is Rs 25,800). Pls share your plan for Samsung a5 mobile at voice and data unlimited or some limitation….Pls clear same like device 75 gb & 4500 min voice calling & 9000 sms. I need Jio 4G Sim Card but purchased Samsung J2 mobile. How to get?